Below are my few tips on how you can bring yourself to a more efficient state of mind. Not being able to disconnect from your personal problems is one of the biggest distractions to being efficient. We can see examples of poor customer service everywhere. Unfortunately, it is still our reality today. 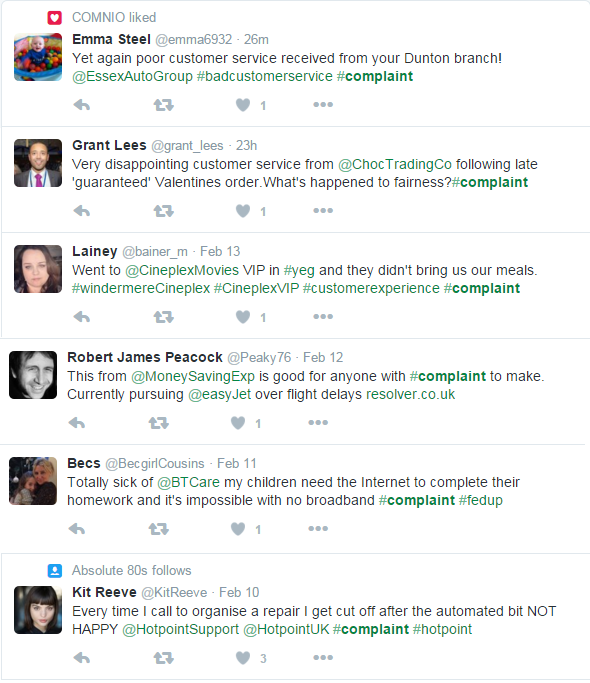 Below are just a few complaints I spotted on the first page of twitter search page by typing a hashtag #complaint. 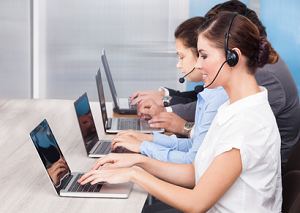 Although there are many causes to poor quality customer service, when it comes to interpersonal interaction between the customer and the customer service agent, most of the time the quality is influenced basically by the mood of both parties. How many times did you contact customer service just to hear an irritated voice or be exposed to plain “don’t care” attitude? Why do you think the agent was treating you like this? I don’t think their irritation had anything to do with you, the caller. You were obviously not the cause of it. It must have been their personal stuff from which they couldn’t disconnect and show professional attitude. Similarly, customer support people are often faced with so much negativity from customers and they feel that the customer needs to contact a psychotherapist to solve the cause of his grief first instead of calling customer service and making ridiculous requests. So, in my opinion, if you are working in customer service and striving to be a more efficient worker and have satisfaction from what you do, the first and the most essential skill to be learned is to be able to put aside your own self, your problems, interests and expectations, and just be there for the customer, totally. It will be challenging many times. If it were not, we’d have no complaints, ever. However, if you can meet this challenge, you will not only become very valuable asset for your company, a great person to deal with for your clients, but you will enjoy your work much more if you can do it full-heartedly. Be grateful for everything, starting from the fact that you have this job. Look at how many benefits it is giving to you. Be grateful for every client that is contacting you – one will teach you something, from another you will get a compliment about your work, a third one will be grateful to you that you have helped their problem etc etc. Just see that you work is important and needed by someone. And feel grateful for that. I think it is really important to nurture the feeling of gratitude inside oneself. It is one of the greatest boosters of one’s efficiency and it’s a natural one. You naturally come to a state of ease inside yourself, you release the tension. This makes you a much better performer than when you are stressed about something or unhappy. I like this quote and what they share on gratitude in this book, and I can’t help but agree. So try it out, the power of gratitude, apply it to your work as a customer service agent, or perhaps you have been doing it already, and let me know how you feel about it. To be more efficient you need to be able to focus your attention on what you are doing at the present moment. Avoid distractions and cut down on multi-tasking. Personally I’ve passed through a few stages from being a crazy mutli-tasker to completely being not a fan of it. I just noticed how strongly disbalanced my mind becomes if I keep pushing the limits and switching the objects of attention every few minutes. After a while, you are not able to concentrate on a single thing for more than a minute, and many times you need to. Perhaps there are some benefits to multi-tasking, but the price is dear. I know many people, based on their own experience, will agree with me. A recent research, beautifully illustrated by the infographics “The High Cost of Multitasking” has shown that it takes more than 25 minutes of average to resume a task after being interrupted. Moreover, 50% of multi-taskers make more errors and experience a 40% drop in productivity. Of course, there are different types of people and some will be able to multi-task with less side effects. Consider your abilities carefully before you plunge into it. Whatever helps your concentration and focus on the customer’s issues, pursue that. I have found that trying to do everything by yourself is a non-efficient mental pattern. Sometimes you just think “Oh, I know what I want to do and how I want to do it, but it will be difficult to explain it to someone else and they will do it wrong anyway”. Get rid of that kind of thinking! First, stop clinging to the idea that everything needs to happen precisely according to your vision. Other people also can come up with great ideas, sometimes (smile). So don’t be afraid to delegate powers and responsibility to other team members. Let it loose, trust their creative genius. Discuss things with your team mates. This will do a few things – take the stress off your shoulders, create a friendlier and more positive atmosphere in your work environment, surprise you with fantastic results you wouldn’t have arrive at just by yourself. So learn to be flexible and work together with other people on equal terms. This is important. Sometimes you are having a bad day and it becomes really difficult to concentrate and focus on the tasks that you need to perform. And I mentioned it above already, you really need to develop the skill to put the personal stuff aside. So this item on my list is what can actually help you to achieve that. Always try to think broad and take a better perspective on everything. If you are feeling tired and it’s very difficult to do your job at the moment, think that you are doing an important job, and it’s important not only for you in terms of making a living or earning reputation etc., but it’s important for the whole planet, the whole Universe, because it really is. No matter what you do, your work is needed, that’s why it exists. So it’s not only about yourself right now, it is about many other people, it is about the whole world after all, as everything is interconnected. Will you let the Universe down? Does your small personal stuff really matter that much? Another example when you may need to start thinking broad is when you have a difficult customer to deal with. You can approach this situation in the same way as when you are having a bad day and you become a “difficult” customer service agent to deal with. Put yourself into this person’s shoes and understand that they might be overwhelmed by something that has happened in their life, or something that goes on in their mind, and they can’t deal with it. So you can show patience with them and be the best help you can. Shifting perception like this and trying to think broader on everything is very helpful to disconnect from all mental or physical distractions and concentrate on performing well and doing what’s needed at the moment. No matter how hard you are working on yourself trying to become more productive and efficient, there are times when you just find yourself going in a loop. This is the right time to forget about yourself for a moment and go check what other people are saying and doing in your field or perhaps even in the field non-related to your work but interesting to you. Communication is extremely important to keep your mind fresh, balanced and inspired. You will find yourself full of new ideas, having a different perspective on the difficult situations you might have encountered with clients and release the work-related stress. So always make sure that you are connected with interesting people who inspire you and use this opportunity to share your experience and listen to theirs. My feeling is life is our greatest teacher and is giving us lessons every moment. It may send us a customer who thinks we should improve something in our service. And usually, our first reaction is, he just doesn’t understand why we are doing it this way, he doesn’t know the limitation behind it. And it is true, of course, from one point. From another point, the customer could just be pushing you to discovering a new innovating way of doing customer service or a new approach to dealing with clients and you cast it aside without looking at it deeply, without thinking, is there anything I can learn from this, is there a way to meet this customer’s request? For this reason, it is my conviction that always being in the state of learning and active perception of what’s going on around, is one of the cornerstones of increasing one’s efficiency and being able to give great performance in the long term, making all, the customer, the company and your own self happy and satisfied. Reward comes the last and that’s why it’s the sweetest. Don’t expect rewards from outside, although they may come also. Take good care of yourself, because you are doing great and important work. After a set of tasks has been completed, take a break and listen to your favorite song, or take a walk in the park if you can. Do something that you enjoy to come in contact with your own self, reassess what you have done and thank all the worldly powers that have helped you accomplish something or make a client happy. Reward you are giving to yourself completes the circle, which starts from you taking full responsibility for how you serve your clients and how efficient your work is. Reward makes it easier for your mind to learn new behavior patters, which may seem difficult in the beginning, such as disconnecting your attention from personal problems. Reward acts as a nail polish fixer (the ladies will understand), which makes the results of your work last longer giving you the possibility to enjoy it. These are all my tips on efficiency for now. Thank you for your time reading my sharing. I hope you have found it useful. I would really like to hear your feedback, especially what you discovered was your biggest hurdle to being efficient in your work. Perhaps it will not be something that I mentioned here. I will be interested to read it. I am going for a walk by the beach now to reward myself for completing this article. How are you going to reward yourself for reading it? This entry was posted in Articles, Best Practice, Tips and Tricks and tagged customer service efficiency, customer support efficiency tips, efficiency in customer serivce, efficiency in customer support, productivity in customer service. Bookmark the permalink. Great advice to put away any personal issues you are having. It shouldn’t carry over into your work or it could effect the quality of service you give. You also should try not to take your work home with you at the end of the day so it goes both ways. Thanks, Drew. Great reminder about not taking your work home. Although sometimes hard to do if you are working from home )). Item 3 translates exactly the problem I pass. I try to be a multi task and end up not performing any of them with quality. I really enjoyed the article, congratulations. Thank you for your comment and sharing your experience, Marcio! Elton, thank you for your feedback and for sharing your experience. I try to be a multi task and end up not performing any of them with quality. I really enjoyed the article, congratulations.